Trint has recently changed the way consumers transcribe and caption video content on Adobe® Premiere® Pro CC with their free caption extension for Adobe® Premiere®. The partnership is a new and much easier approach to transcribing and applying captions to videos swiftly and accurately. Adobe® has been long established as the industry leader when it comes to creative software, and the highly popular Creative Cloud, a software suite of their best-loved programs, has been used by over 12 million subscribers. Trint’s partnership with Adobe® also represents a step toward becoming a widely accessible tool worldwide. Thanks to the ubiquity and power of Premiere® Pro, Trint now has the ability to play its part in improving the working lives of countless individuals through this functional and simple-to-use extension. The plugin itself, a compact 568kb free add-on, was released on the Adobe® Exchange® catalogue on May 4th, 2018. The editing tool makes use of artificial intelligence (AI) to seamlessly transcribe captions and subtitles, allowing users to add text to media files in a matter of moments. Trint's panel for Premiere® converts audio and video tracks to SRT and EDL files – enabling simple integration into a number of different projects. What does this boil down to for video editors? In short, they can say goodbye to hours of manual captioning. When Adobe® announced their partnership with Trint on their dedicated blog in April 2018, author Sue Skidmore was keen to highlight the convenience the collaboration will create for users: "Using Trint’s automated speech-to-text technologies, editors quickly get a machine-generated draft transcript that they can easily polish to perfect in the Trint Editor. The transcriptions our tool corrects will be available in the panel, giving editors direct access to SRTs and WebVTTs from within Premiere® Pro CC," Skidmore said of the product. Skidmore’s comments are a reflection of a world that’s becoming increasingly comfortable in front of the camera. From the rise of high-quality videos created by professional YouTubers for millions of subscribers, to some of Hollywood's most impressive work in recent times, film and video are becoming both more prevalent and more sophisticated. Premiere® Pro itself, while being the go-to for most amaetur and professional videographers, also has a pretty star-studded resume: Avatar, Hugo and Gone Girl were all produced in post using Premiere® Pro. The software's accessibility makes it a great fit for filmmakers and YouTube-based beginners alike, which carries an appeal that can't be shared for much of the industry's alternate video sharing programs. It's this level of accessibility that is ideally complemented by Trint’s automated captioning plugin. While there are other digital transcription platforms available online, precious few have the ability to make the process of automatically transcribing and captioning audio hassle-free for anyone from film veteran to inexperienced student. The key in the Trint-Adobe® partnership was to achieve a level of integration that's unrivalled in video transcription services. This came about by creating a panel that enables a swift upload of video files for an automated transcript that makes the audio searchable, as well as the ability to set up captions instantly. Trint is incredibly proud of the way it has leveraged speech-to-text technology. Converting audio to text brings editors a simple and reliable of method of getting a machine-generated transcript that they can polish to perfect in the Trint Editor, providing an extra level of oversight (should it be required). Any transcripts that are corrected in Trint Editor are also available in the Premiere® Pro panel, enabling editors to have direct access to SRTs all from within the application. 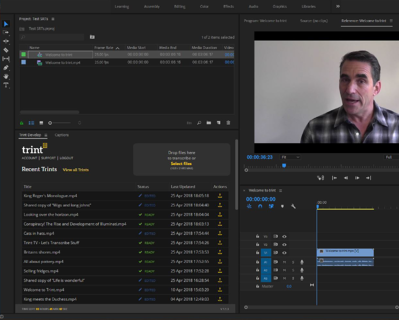 Trint’s captioning and subtitling extension for Adobe® Premiere® Pro makes automated transcription technology accessible not only to large organizations but to all content creators. Trint provides an essential tool that is quickly becoming the new standard in automated transcription. It’s a goal that’s been aided by the recent release of the Trint Mobile IOS app. Trint’s plugin for Premiere® Pro is free to integrate into the software and users are able to access the functionally immersive features on their existing Trint accounts. Pay-As-You-Go subscriptions are also available for those who need a little monetary flexibility. Price plans are available here. All users of Trint’s extension for Adobe® require a Trint account and are able to sign up directly on the company's official website for free. A free trial is also available for new users who would like to try the service before committing.